A group of young people, a bear and a mosquito dance altogether in the front-yard of every house in the lower Assam villages singing ‘Maho-ho’ songs. They dance round and round in the front-yard knocking the ground with the bamboo sticks on their hands for driving out mosquitos. Carrying out dance in the every house they also pray for divine blessings and well-being for everyone. The head of the family offers them some food-grains and money which the team takes with pleasure and make fun-feast with the things come on offer afterwards. In the treasure house of folk culture, Maho-ho is very popular in Assam which prevalently represents the tradition and culture of Barpeta district. People believe that after the Maho-ho festival mosquitos vanish or decrease in the village. This folk festival is observed in the full moon night of ‘Aghon’ - the eight month in the Assamese calendar that falls in the second part of November. Generally youth participate in singing and dancing in this festival. It is believed that bear eats mosquitos. On the other hand, mosquito’s bite may cause ailments to human health. So for preventing or driving out mosquitos Maho-ho is celebrated. 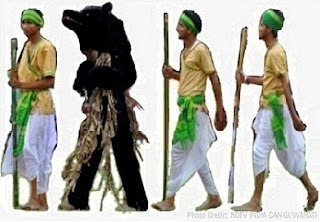 For performing this tradition, a person represents a mimic bear wearing a bear like mask and outfits and one more person wears mask to act like a mosquito. A person in the group starts singing Maho-ho song while others follow him and dance with the mimic bear and the mosquito. It is stated that the word ‘Maho-ho’ is derived from Assamese word ‘Mah’ means mosquito and Bodo word ‘Hw’ (‘Ho’) means to drive out, although there exists some other views. The Maho-ho folk culture is seen in various places in lower Assam, such as, Nalbari, Mangaldoi, Goalpara with similar type of songs like Maho-ho songs in Barpeta except respective dialectical differences. Again, Maho-ho is known in different local names, such as, O-ri or Euri-Moga in Goalpara, Bhao in Barpeta, Bhalok or Bhal-Bhowlka in Nalbari and so on. Maho-ho is very similar with Bihu Husori having objective of social well-being. On the other hand, Bambul-Pita songs of Baska (Tamulpur) area also have closeness to Maho-ho. Maho-ho is a magnificent type of folk culture of Assam. In this connection, we may mention one book ‘Asomiya Sahitya-Sanskritir Abhash’ written by Archana Konwar, where the author is narrating about this folk culture.The Maho-ho songs may or may not be much significant in literature point of view, but it is indispensably an enriching aspect in the treasure house of legendary culture of Assam. This edition consists of four research articles, out of which, Naba Kanta Sarma has written one article on mathematical science. Other research articles on social themes are written by Aminul Islam, Gopal Das and jointly by Plabita Bhattacharyya andPulak Bhattacharyya. Again, out of the three essays on emerging issues category, one review essay written by Tarun Saikia is quite informative with lot of references. Priyanka Hazarika is discussing on Satra Society in Majuli – a large river island in the Brahmaputra River. The global environmental problem is a major concern today and Dibya Jyoti Kalita is discussing in an article about the impact assessment of environment in India. The book review prepared by Sankar Biswas on the book ‘English Language Teaching – North East Perspective’, edited by Shiva Prasad Mili, is augmenting to this issue with a reader’s viewpoint about the benefit of English language teaching. Above all, this New Year issue is adorned with one short story written by respected Ajit Bikash Gohain Barua sir and translated by Bibekananda Choudhury sir, and five beautiful poems composed by eminent American poet, Alan W. Jankowski, Palma Mingozzi, Dhiren Doley, Naren Nriom Das and Shweta Sur.We hope readers will like them reading. We take the opportunity to thank you all for support and cooperation towards growth of the e-journal. We are inspired enough in keeping ahead. We are indebted for their guidance to the members of the honorary advisory board and honorary members of the technical review board. We are thankful to the research scholars, authors, writers, poets for their contributions in making our efforts successful. We could not cover to publish all submission in this issue and hence, request contributors to cooperate till the future issues. Wish you all happy and prosperous New Year 2016!